EN Time for another Inspired by feature. Today I illustrated Lera from lerablogs. The medium is watercolour and pencil. This time I decided to leave the pencil outline. Sometimes I do, sometimes I don't. Sometimes I don't even use the pencil the sketch, but rather apply the watercolour directly. How do you like this outfit? Isn't it dreamy? Isn't it so timeless? I was thinking about what I could illustrate next and then I remembered that it was a while since I illustrated Lera, so I browsed her blog and as soon as I saw this look I knew it is the one that I want to illustrate. 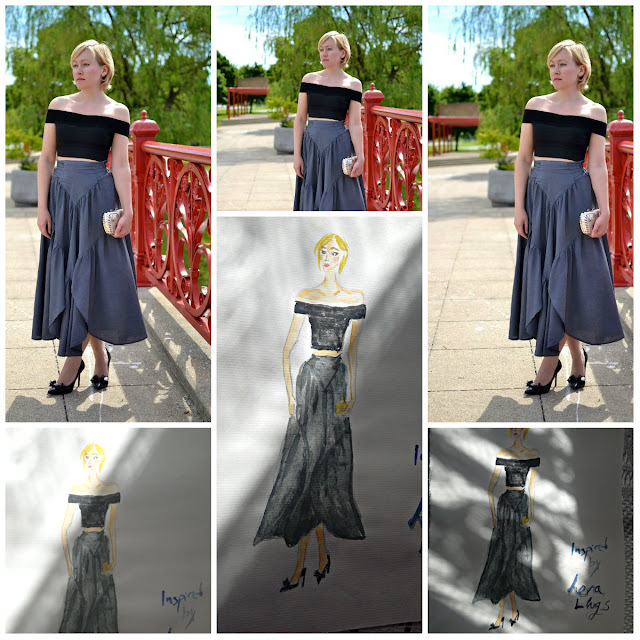 So, here it is, my fashion illustration of the day. 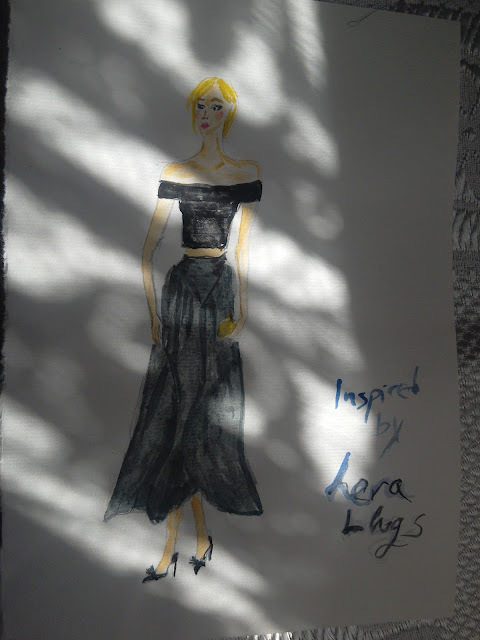 To put it more precisely- my fashion illustration of a fashion blogger. If you love fashion, you probably also love fashion illustrations. If you like fashion bloggers, you probably also like illustrations of fashion bloggers. Logically speaking, you should enjoy this one. Well, that would be all for today. Thank you for reading...and a very special thank you for all the comments you left on my last post. You are the best readers ever!!! HR Vrijeme je za još jednu Nadahnuta s rubriku. Danas sam naslikala Leru s lerablogs. Medij su vodene boje i olovka. Ovaj put sam odlučila ostaviti obrub olovkom. Ponekad ga ostavim, ponekad ne. Ponekad i ne koristim olovku za skiciranje, nego direktno stavljam vodene boje na papir. Kako vam se sviđa ova kombinacija? Zar nije divna? Zar nije bezvremenska? Razmišljala sam o tome što bi mogla iduće ilustrirati i onda sam se sjetila da već dugo nisam ilustrirala Leru, pa sam malo pretražila njen blog i čim sam vidjela ovu kombinaciju znala sam da je to to. Tako da evo je, moja modna ilustracija dana ili da budem još preciznija- moja modna ilustracija modne blogerice dana. Volite li modu, vjerojatno volite i modnu ilustraciju. 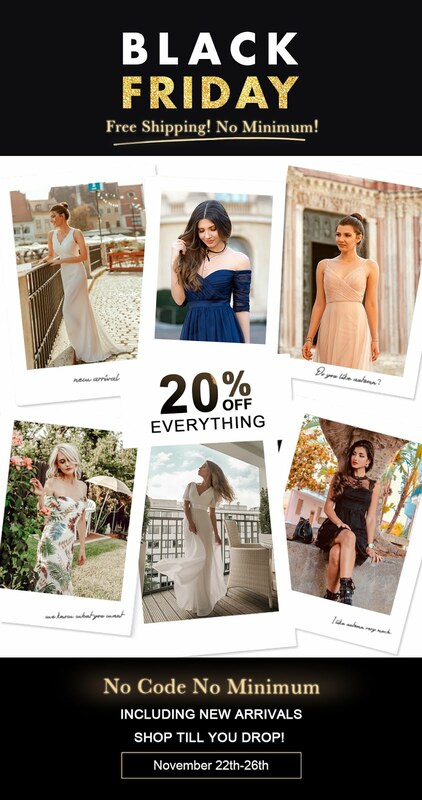 Volite li modne blogere, vjerojatno volite i ilustracije modnih blogova. Logički gledano, trebalo bi vam se ovo svidjeti. Tako da, to bi bilo sve za danas. Hvala na čitanju...i velika hvala na svim komentarima koje ste mi ostavili na zadnjoj objavi. Vi ste najbolji!!! Your painting is so beautiful! You are so talented. thank you Kizzy, yes she does look gorgeous. I'm glad I managed to capture her gorgeousness:). wow! you are so talented! LOVE this look! Timeless, indeed :) So pretty! hvala i meni je to jedna od najdražih rubrika. Oh wow, really beautiful, dear Ivana, a very lovely illustration! I loved the outfit and I agree with you, timeless for sure! I like midi skirts and off the shoulder tops and saying that they are "the trend" now is not real - they are always worn! I think you did a very great job, as usual! I don't know if I checked your last post, I will take a look now - you know I come here around twice a week! Hope you have a very nice day, dear Ivana! Hugs! thank you sweetie, you don't have to worry about keeping up with all my posts. Sometimes I post daily, sometimes only once or twice a week, it depends. Her outfit is lovely! You did an excellent job capturing it. I love off the shoulder top and dresses. Your painting is lovely! Waow ! very beautiful and interesting. You certainl have a gift and I hope this will serve you one day. I love your outfit, very nice and these shades look great on you. Gostei desse look belo desenho. I am not big on fashion, so I dont follow many fashion bloggers, but I enjoy anything creative, so I did enjoy your painting a lot. 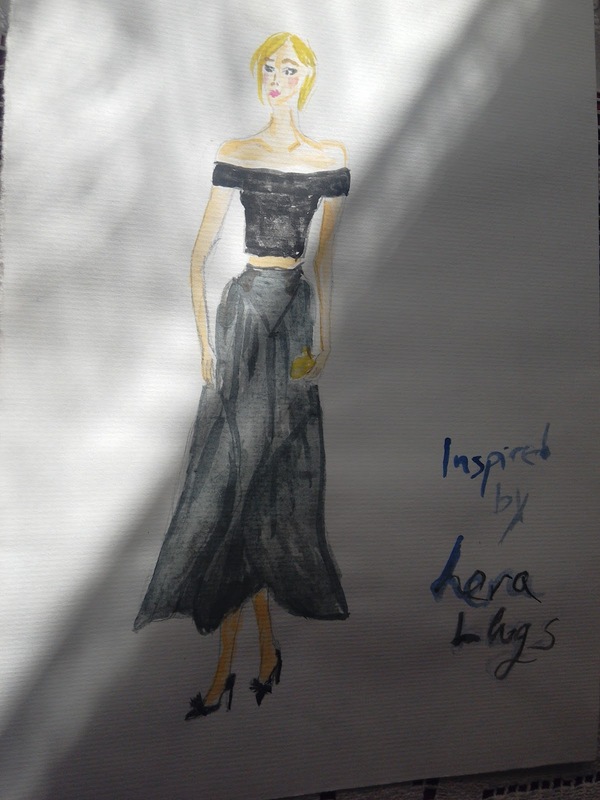 You are so right as a fashion blogger I am naturally drawn to fashion illustrations. I love when you feature yours. 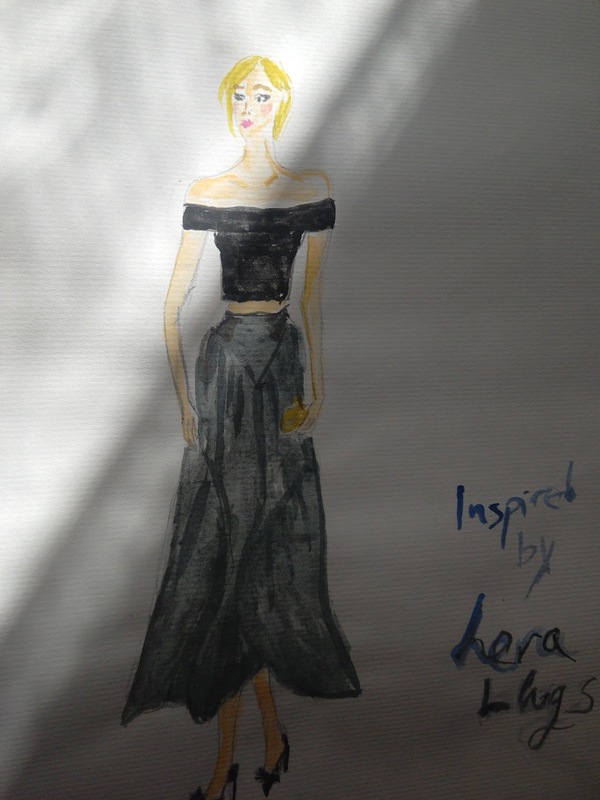 your inspired illustration of Leras Outfit is great – and the outfit, especially the skirt – is wonderful, too! I like your blog, would you like to follow each other on GFC ? Wonderful picture! Feminine and elegant outfit!